You can close your eyes, but you cannot close your ears. You continue to hear even when you look away. Any competent cognitive neuroscientist will confirm that echoic memory is vastly superior to iconic memory. 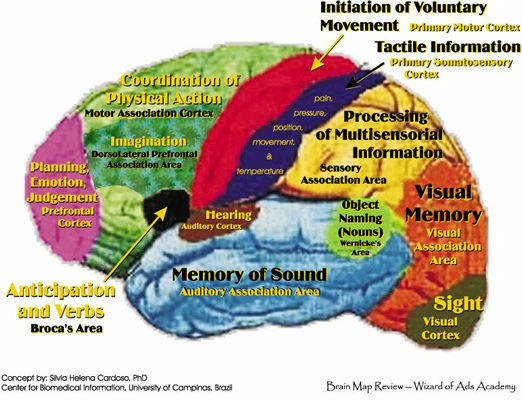 Words, statements, phrases, jingles, and songs, which surprise Broca’s area of the brain, are much more easily implanted and recalled than visual images. Echoic retention causes people to remember things they never committed to memory, and a working knowledge of it gives one the ability to work miracles through the power of words. Echoic retention and the power of words is the heart and soul of advertising, though very few ad professionals understand it. If you are booking long-term, it is easier to achieve frequency with the same listener each day on the radio than it is to repeatedly find the same viewer during television prime time. Consequently, it’s much easier to win the battle of Frequency vs. Sleep using radio. Great writers understand that the word “You” conjures up a different mental image in every human mind. One of the greatest advantages of radio is the absence of visual images. This allows the radio ad to be about the listener, personally. Example: When you say …“So the next time you reach into your letterbox,” every listener will “see” their letterbox in the Dorsolateral Prefrontal Association Area in their minds, their imagination.